The manager of prisoner Herbert Colanggo testified again at the trial of detained Sen. Leila de Lima on March 27. Reynante Diaz appeared before Judge Amelia Fabros-Corpuz of the Muntinlupa Regional Trial Court Branch 256 at the New Bilibid Prison (NBP) courthouse. Diaz was cross-examined by the defense on case 17-167 for conspiracy to commit illegal drug trading filed by the Department of Justice (DOJ) against De Lima, former Bureau of Corrections director Franklin Bucayu, Joenel Sanchez, Ronnie Dayan, Wilfredo Elli, prisoner Jaybee Nino Sebastian and Jose Adrian Dera. They are accused of using NBP inmates to sell and trade dangerous drugs using mobile phones and other electronic devices, and getting P70 million between March 2013 to May 2015. Diaz was cross-examined by Reynaldo Robles, lawyer of Bucayu but during questioning by De Lima’s lawyers, his blood pressure shot up to 170 over 100, prompting Judge Fabros-Corpuz to cut short the hearing. Boni Tacardon, De Lima’s legal counsel, deferred commenting on Diaz’s testimony until they have finished cross-examining him. “Pero kung siguro kay Director Bucayu, ang sinabi lang niya dun na hindi naman niya nakakausap si Director Bucayu. Lahat ng perang sinasabi niyang binibigay niya, binibigay lang niya kay Colonel Elli, at wala siyang direct knowledge kung anong ginagawa ni Colonel Elli sa pera. Ina-assume lang daw niya na binibigay kay Director Bucayu,” he said. In the Feb. 14, 2017 joint resolution by the DOJ that became the basis for the filing of three drug cases against De Lima, Diaz said he met Colanggo in September 2012 when his band performed at the latter’s birthday. Colanggo is a singer who has released an album while serving time at the NBP. He said that from October 2013 to November 2014, he allegedly gave P3 million monthly to De Lima through Sanchez, who in turn, passed it to Dayan. Diaz said he overheard Dayan talking on the phone, saying “Mam OK na” to which the party on the other line replied, “OK sige bilisan nyo.” He also said that he delivered money at the DOJ where Sanchez would get it and give it to Dayan who was in a Starex van. He added that he gave P1 million to De Lima for events by Colanggo in NBP. He claimed that a total of P45 million was given to De Lima. He also pointed out that he allegedly gave P1.2 million monthly to Bucayu starting November 2013 through Ellie, and also gave money to Rafael Ragos, former BuCor officer-in-charge. Senior Assistant City Prosecutor Ramoncito Ocampo Jr. said Diaz’s testimony is important to the case. “Because he was able to testify and prove that he did make delivery of money to Joenel Sanchez. 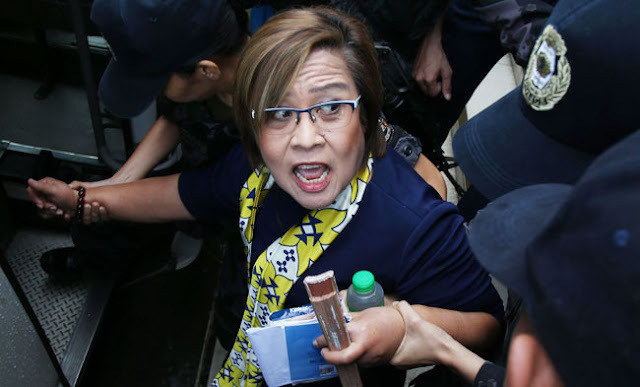 That should be implied that Sanchez is the bodyguard of Senator Leila de Lima. However, his testimony with regard to the aspect of Senator De Lima, we will also be presenting Herbert Colanggo. Because he was the one who instructed Reynante Diaz to deliver the money,” Ocampo said.